Today AMD released their Q1 FY 2015 financial results, and the company reported revenue of $1.03 billion for the quarter. This is a 16.9% decrease as compared to Q4 2014, and a 26.4% decrease from the $1.40 billion recorded in Q1 2014. Operating income based on GAAP numbers was an operating loss of $137 million, which is a substantial decrease in loss as compared to Q4 2014, where they had an operating loss of $330 million, however in Q1 2014 they had a small operating income of $49 million, so although they have improved quarter-over-quarter, that is a significant reduction year-over-year. Net loss for the quarter was $180 million, or $0.23 per share, which once again is better than Q4 2014 where there was a $364 million ($0.47/share) loss, but much worse than the $20 million ($0.03/share) loss in Q1 2014. Part of these losses are due to the ongoing restructuring at AMD, which has contributed heavily to these numbers. One of the new restructuring fees is due to the exit from the Seamicro branded dense server business, which has cost them an additional $75 million this quarter, including $7 million in cash. Due to these hits, AMD also provides Non-GAAP results which exclude these numbers. On a Non-GAAP basis, AMD’s operating loss is just $30 million, however that is still down significantly from the $89 million operating income in Q1 2014, and the $52 million operating income from last quarter. Net loss on a Non-GAAP basis is $73 million, or $0.09 per share. This is a decline from Q4 2014 where there was a net income of $18 million ($0.02/share) and Q1 2014 where they were able to achieve a net income of $35 million ($0.05/share). AMD has also entered into a fifth amendment of their agreement with GlobalFoundries, and AMD is expecting to purchase about $1 billion in wafers in 2015. Breaking down their product segments, the Computing and Graphics segment had a 20% decline in revenue quarter-over-quarter, and a 38% decrease year-over-year, with Q1 having net revenues of $532 million. The quarterly decrease was due to lower desktop and notebook processor sales, whereas the yearly decrease was due to lower desktop processor sales and GPU channel sales. The division had an operating loss of $75 million for the quarter, which is a significant change from the $56 million loss last quarter and the $3 million income in Q1 2014. The loss was partially offset by lower operating expenses, but clearly more work is needed. AMD is hoping for better success with their new APU, Carrizo, which they are expecting to deliver double digit performance increases and much better energy efficiency compared to Kaveri, which is the current APU. The Enterprise, Embedded and Semi-Custom segment had a year-over-year revenue decrease of 7%, and a quarter-over-quarter decrease of 14%, with Q1 2015 coming in at $498 million. The quarterly drop is due to a seasonal decrease in semi-custom SoC sales (read: Consoles had a ramp up for the holidays and are now back to lower sales) and the yearly decrease is due to lower numbers of server processors being sold. However this segment did have an operating income to report of $45 million for the quarter, but this is down from the $109 million in Q4 2014 and $85 million in Q1 2014. The “All Other” segment had an operating loss of $107 million. As compared to Q1 2014, this is $68 million more operating loss, which is primarily due to the $75 million hit for exiting the dense server business. In Q4 2014 this segment had a $383 million loss. For Q2, AMD is forecasting revenue being down an additional 3%, plus or minus 3%, and non-GAAP Gross Margin to remain flat at 32%. AMD is certainly not in a great position right now, and the new CEO Dr. Lisa Su has some work to do in order to get AMD back to a financially viable state. Part of that is diversifying revenues, especially with the PC market slowing again. 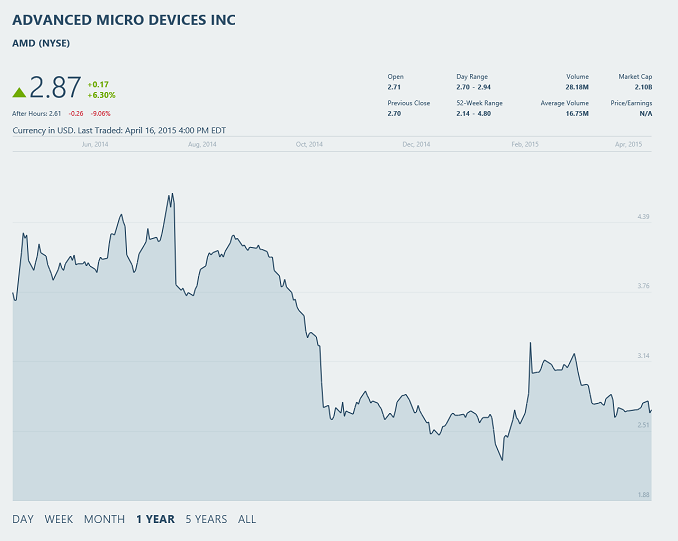 AMD has not had a significant product launch in a few quarters, which has not helped either. I wonder how many people are in eternal hell because they got messed up when the housing crisis happened. When netzero fell, when AOL fell.. when Enron fell.. Kodak fell.. due to bad strategies found by people who were smarter and had the team power to make what has been made Better.